You are a wizard that has come back home from a successful campaign where you and your party explored a keep and slaughtered countless numbers of orcs and ogres. You are a little richer for your efforts, but you are mainly tired, thirsty, and ready to enjoy a cool beverage. But not any beverage will satisfy the dungeon crawler in you. No, you need a special drink made by the folks over at Jones Soda. Behold the Limited Edition Dungeon & Dragons Spell Casting Soda, designed specificatlly to quench an adventurer’s thirst. 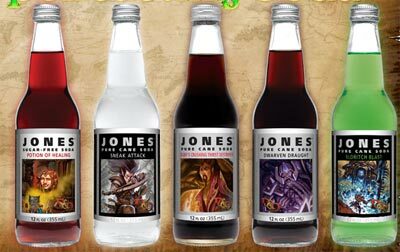 As with other Jones Sodas this limited edition is covered with an eye catching label that features D&D artwork and contains soda flavors that most players of the classic tabletop game should recognize. Imagine guzzling down a bottle of Bigby’s Crushing Thrist Destroyer or maybe downing some Dwarven Draught. How about chugging some Sneak Attack, Potion of Healing, or maybe Eldritch Blast. The Illithid Brain Juice, however, you might need summon some additional courage to drink it. If interested you can purchase a 6-pack of the Limited Edition Dungeon & Dragons Spell Casting Soda for just $10.99 or if you have a more heroic thirst, a 12-pack will cost you 18.99 gold, err I mean dollars. And I’m told if you buy some now, you will also receive a Drow Assassin Figure to go along with your order. Tja… jetzt müsste man das Zeug nur noch in der BRD bekommen um einen Versuch zu wagen, was die Geschmacksrichtungen anbelangt. Schlimmer als britische Limo kanns jedenfalls wohl kaum werden. Rollenspiel ist hierzulande doch som populär, da hat jedes fanzine seine eigene Brauerei. watch this -> http://www.greifenklau.de 😉 In Jonis Blog wird übrigens gerade eine sammelbestellung organisiert.